On a rainy, cool day Ha Tien is a warm and welcoming site. 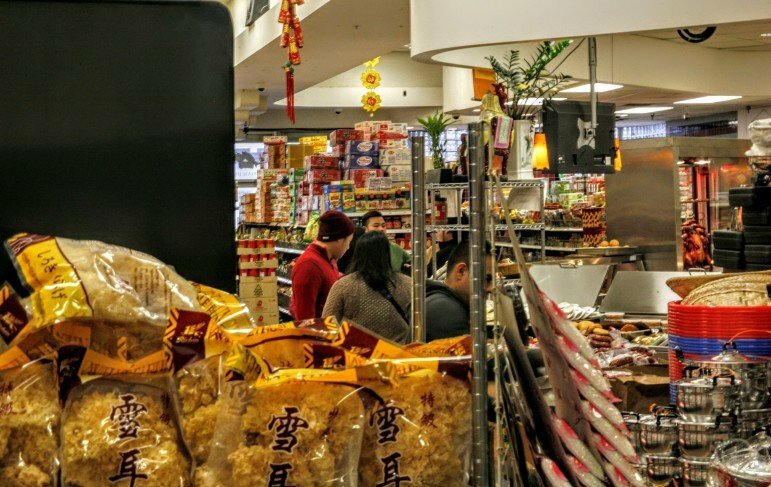 The shelves are lined with colorful products, and the aroma coming from their deli – roasted pork and pepper shrimp – is intoxicating. It’s been over a year since the Daily Planet last stopped in to Ha Tien Market. In that time, much has changed around the grocery store, located at 353 University Ave. The Green Line has been completed, construction has ended, and things are starting to settle down into a new normal. Roast Duck at Ha Tien. Photo by Suada Karic. But according to Ne Dao, proud co-owner with her husband Son, that new normal may not be for the better. Standing in the midst of their root vegetable section, we discussed how the Green Line had affected their business. Did it bring in new customers? Was it easier for old customers to reach the Market? To my surprise, Ne spoke critically of the light rail station that sits in front of her business. “No, I don’t like it. The traffic seems busier. I see more cars. I see more crime and I don’t like it,” she said. For Ne and her business, the increased traffic on University has not made it any easier for her customers. Speaking from first-hand experience when I tried to park in the parking lot, the traffic on University is intimidating for anyone trying to get around the area. Her comment on the increased crime surprised me. I had expected that the Line would have brought in new customer volume and helped old customers arrive easier. Instead, Ne says most of her customers don’t use the Green Line. Instead, it’s the customers who have been most affected by the crime. “There have been four or five incidences where customers have been robbed,” Ne said. According to Ne, these robbers have found a way to use the Green Line for their benefit. They are able to take the light rail to the station next to Ha Tien, where they jump off. They then approach customers along the street or parking lot, rob them, then jump back onto the Green Line before anything can be done. Ne says that they usually steal purses and similar items. And apparently this isn’t an isolated incident. I asked if she had heard of similar reports from anyone else in the area. Even rainy days are busy. Photo by Suada Karic. Increasingly surprised by what Ne was saying, I finally had to ask what she had expected when the Green Line came in or if any of this was a surprise. “I thought that since the street was busier those things wouldn’t happen. But they do and I don’t like it,” she said. With the holidays fast approaching, I wondered if any of this might impact the business. Ne didn’t seem to think so. Construction on University last year had closed off the street in front of Ha Tien for several months. 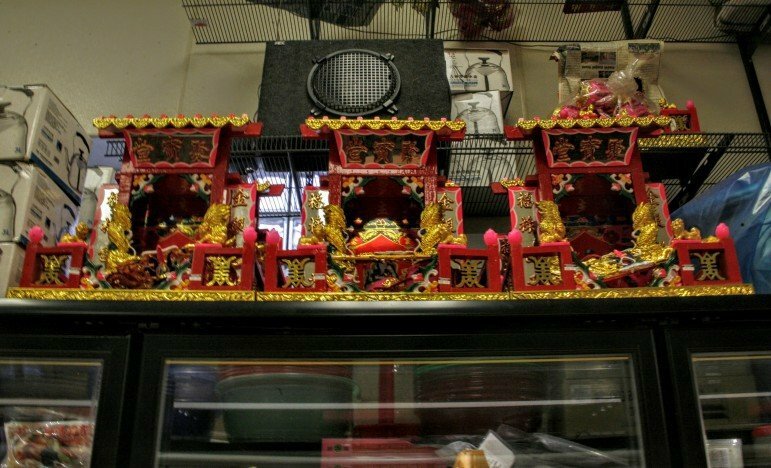 Even by November, some customers weren’t sure Ha Tien could be reached. But this year, Ne seems confident that their business will do well. She says they’re stocking up on some key foods. 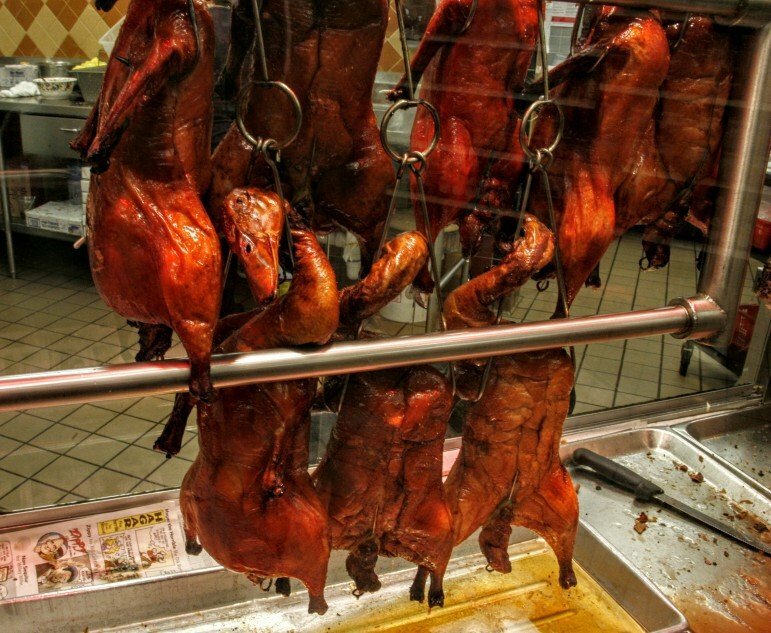 “Lot of roast duck and pork,” she says with a smile. This time of year, Ha Tien even offers a special treat: customers can bring in their own duck and they will roast it for you. Despite the incidences Ha Tien and the local neighborhood have experienced since the Green Line, Ne seemed steadfast on staying in the area. Even when asked if she’d consider moving her business, Ne refused. A shrine at Ha Tien Market. Photo by Suada Karic. Cheap public transit with connection to north minneapolis, what could possibly go wrong? hmmm… the green line connects to the radically gentrified, homogenous and white North Loop. Are you calling out the billionaire thieves, John? If so, I’m with you! Glad that Ha Tien is staying where it is. I used to live a couple blocks away and loved going in there before or after I got on the bus. Yum! so ruthless brigands ride the green line. depart the platform. do some crimes on the nearest victim, then rush back the the train platform where they uh.. patiently wait 15-20 minutes for the next train to arrive and then abscond rails only to repeat their cycle of crime it up at the next stop? 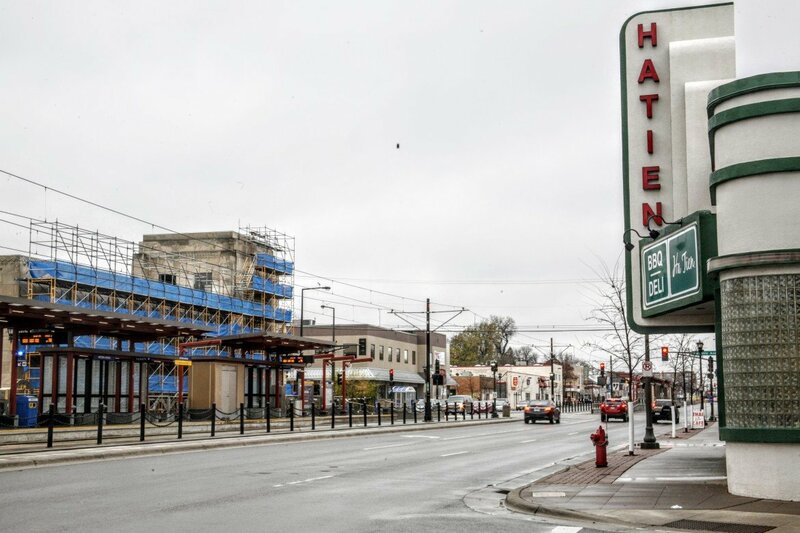 The small chartreuse and white building on the corner of East Lake Street and Stevens Avenue might be easy to miss, but what goes on inside might well become a model for solving the problem of fresh produce and healthier foods in lower income neighborhoods. The Good Grocer, a new kind of neighborhood co-op that opened June 15, is already getting healthy and affordable food to people in the area.